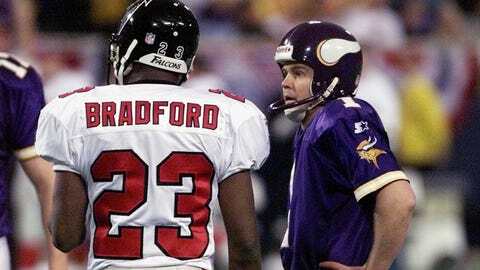 Vikings kicker Gary Anderson reacts after missing a 38-yard field goal in the NFC Championship Game on Jan. 17, 1999. MINNEAPOLIS — It served its purpose. That was the most emotional sentiment former Vikings offensive lineman Tim Irwin expressed toward the Metrodome in a conversation with reporters before the team’s second-to-last home game in the building last Sunday. "Let’s kill this one and move on to something bigger and better," Irwin said. Demolition crews will do just that this upcoming January while construction continues on a new home for Minnesota’s NFL franchise. There are many reasons sports aficionados around here will be sad to see the old building go; memories, moments and big games abounded during the Dome’s 31 years of operation. But there are some that folks would rather forget about, too. For Irwin, it was playing the game of football indoors as opposed to outside. Baseball players often lost sight of fly balls due to the structure’s white Teflon roof. And the old venue’s tenants experienced some pretty painful junctures, too — too many to count in a sports market fraught with cynicism and a collective mindset that awaits the next disappointing failure. 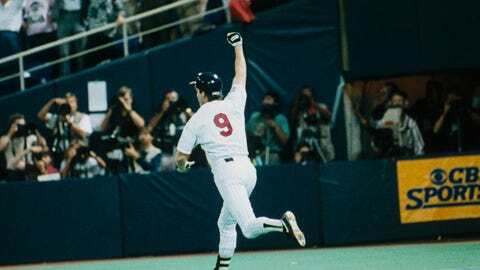 That attitude didn’t come out of nowhere, and much of it is rooted in the Metrodome’s three-decade history. Picture a gigantic sauna with 46,000 seating spaces, absorbing the mid-July Minnesota sun and trapping the oppressive heat it emits. Now try playing — or even watching — baseball in it for three hours. Those who witnessed or took part in the Twins’ inaugural season in the Metrodome don’t have to imagine; the building did not feature air conditioning during its first year of operation. The resulting sweaty conditions precipitated a ticket sales regression, and air conditioning was installed and first used in June 1983. Once the blowers were put in place and turned on, conspiracy theories arose that the grounds crew used them for the home team’s benefit — pointing them toward the outfield to aid ball travel, cooling down Minnesota batters but not opponents, and so on. As difficult as it is to dig up bright moments in the University of Minnesota’s football tenure inside the Dome, it can be even more of a challenge to single out the embarrassing junctures. An epitomizing one came Nov. 16, 2002, when nemesis Iowa waltzed into town and hung a 45-21 beatdown on the Gophers. The Hawkeyes clinched an undefeated season, the Big Ten title and the rivalry’s traveling Floyd of Rosedale trophy. Afterward, Iowa fans tore down the Metrodome goalposts and paraded them around what’s now known as Mall of America Field. Oct. 15, 2005 brought one of the more evenly set-up clashes in Minnesota and Wisconsin’s longstanding border rivalry — both teams were nationally ranked — and all the Gophers needed was one first down to seal it. But the Badgers defense held, and what happened next still serves as overarching evidence to Minnesota’s mediocrity during the past several decades. Punter Justin Jucek mishandled the snap, linebacker Jonathan Casillas blocked his attempt at a running, sideways kick, and Ben Strickland recovered just before the ball rolled out the back of the end zone to cap a stunning rally and a 38-34 claiming of Paul Bunyan’s Axe. Those who scoffed at the idea of an inflated Teflon roof surviving the Minnesota elements gained some fuel for their sentiments on several occasions. A storm Wednesday, April 13, 1983 dropped 13 1/2 inches of snow on Minneapolis and caused the Twins’ game the next day against the Angels to be postponed. Late the next night, a chunk of ice created a 20-foot tear in the roof and caused it to deflate, but crews were able to repair in time for the Angels and Twins to square off the following Friday. On April 26, 1986, a storm tore another hole in the roof during the ninth inning of a game — also against the Angels — causing a 9-minute delay as one seating area of the stadium was evacuated. As the typical Minnesota sports fan is well aware of, there were plenty of collapses to take place within the Metrodome’s walls, but none were more literal than what took place the morning of Dec. 12, 2010. The Dome’s roof collapsed under the weight of heavy snow, forcing the Vikings’ game against the Giants that day to be moved to Detroit’s Ford Field (it had already been postponed to Monday after the same wicked winter storm shut down Minnesota air traffic). The Vikings’ final home game of the season, against Chicago, was played at the University of Minnesota’s TCF Bank Stadium, and many point to the collapse as a turning point in the team’s efforts to persuade city and state government officials to back the building of a new stadium. Two of professional football’s lengthiest plays took place inside the Metrodome, and both came at the Vikings’ expense. Cowboys running back Tony Dorsett provided the first Jan. 3, 1983, plunging off left tackle and breaking three tackles on his way to a 99-yard touchdown run. It stands today as the longest rush in NFL history, and only 14 other plays from scrimmage — all passes — have gone for 99 yards. Minnesota went on to win 31-27, however, and made it to the divisional round of the NFC playoffs that year. The second record-breaking jaunt inside the Dome came courtesy of San Diego Chargers defensive back Antonio Cromartie. In an eventual Vikings rout Nov. 4, 2007, Cromartie snagged Ryan Longwell’s missed 57-yard field goal in the back of the end zone and raced 109 yards for a touchdown, setting a new record for the longest play in NFL history. Luckily for Minnesota, a rookie named Adrian Peterson broke the league’s single-game rushing record that same day, and the Vikings went on to win 35-17. Dollar hot dog night took on a whole new meaning May 2, 2001 when bitter Twins fans threw hot dogs — among other projectiles, including batteries, golf balls and plastic beer bottles — at Yankees left fielder Chuck Knoblauch, who spent the first seven years of his career in Minnesota before being traded to New York in 1997. Twins manager Tom Kelly exited to the dugout to plead with fans in left field — "Fans, now quit this!" he reportedly said — during the first inning, and umpires pulled the Yankees off the field for 12 minutes in the sixth. Officials mulled over the idea of calling the game a forfeit, and more than 40 fans were ejected. For the record, the Twins won 4-2. On May 4, 1984, A’s longball specialist Dave Kingman launched a Frank Viola fastball high into the Metrodome air. It never came down. Kingman’s shot instead flew into a seven-inch-wide drainage hole in the roof’s inner layer. He rounded the bases, meanwhile, while Twins players and the umpires stood still, looking confused. Minnesota first baseman Mickey Hatcher grabbed another baseball and tagged Kingman out, but the officials weren’t fooled. They eventually ruled the dubious play a ground-rule double, and the Twins went on to win 3-1. Kingman became the first player to lose a baseball — literally — in the roof of a Major League ballpark. No offense taken from Vikings fans who click to another webpage when they see those two words. Kicker Gary Anderson hadn’t missed a field goal or extra point all season, and his 38-yard attempt with 2:07 remaining looked like a gimme to ice victory against Atlanta and clinch the NFC championship Jan. 17, 1999. But Anderson pushed it barely wide left, and the Falcons drove 72 yards to knot the score at 27. After Minnesota coach Dennis Green decided to have quarterback Randall Cunningham take a knee with 30 seconds left and go to overtime, Falcons kicker Morton Andersen sent Atlanta to the Super Bowl with a successful kick from 38 yards out — the same distance Anderson had missed from.